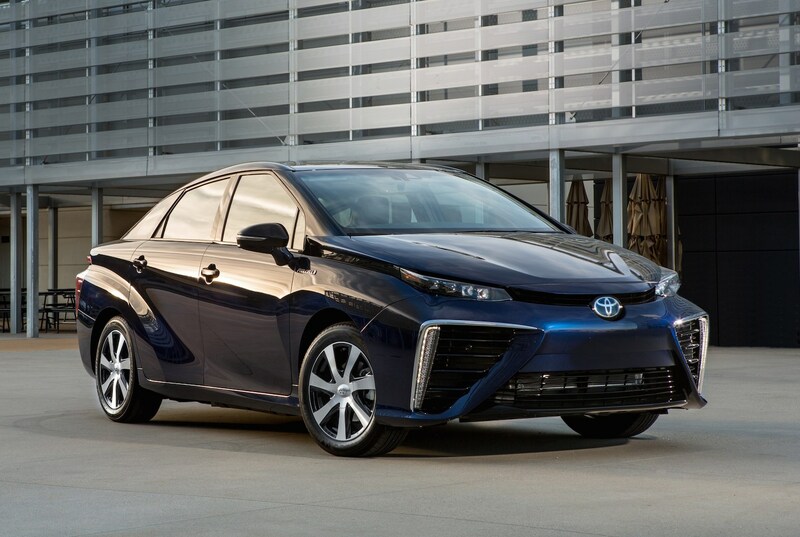 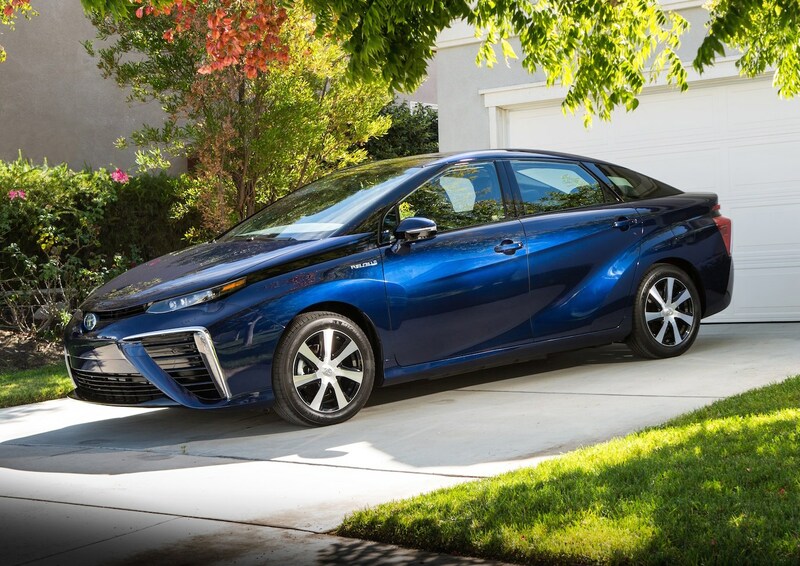 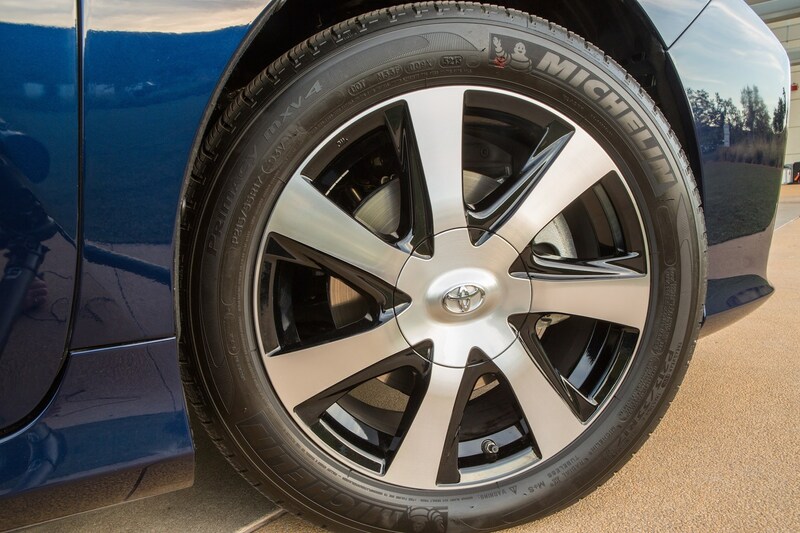 The Toyota Mirai is not a conventional car. 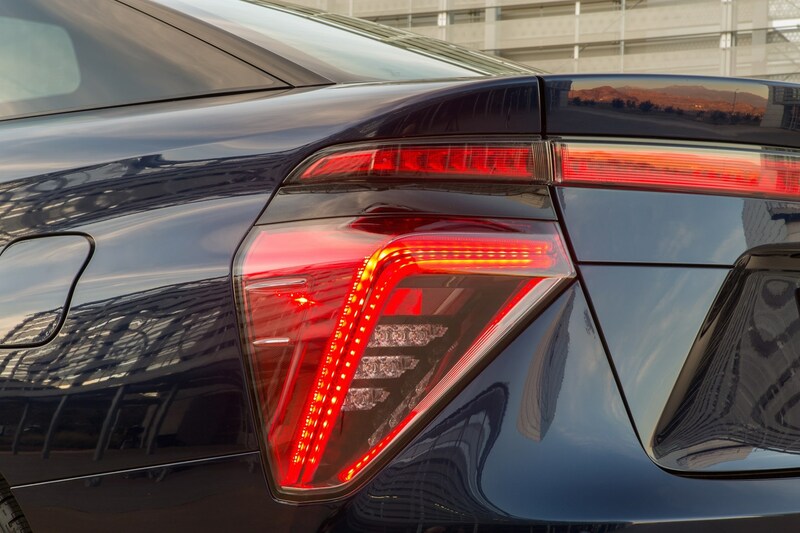 It's not a car for the me-too drivers among you, and nor is it one that you're going to want to choose for rational reasons. 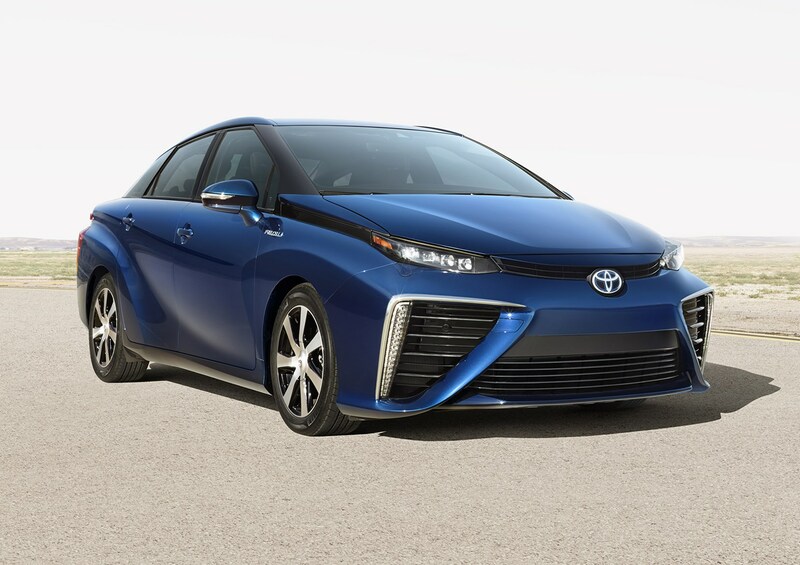 It's on of the first cars you can buy over the counter in the UK that's powered by hydrogen. 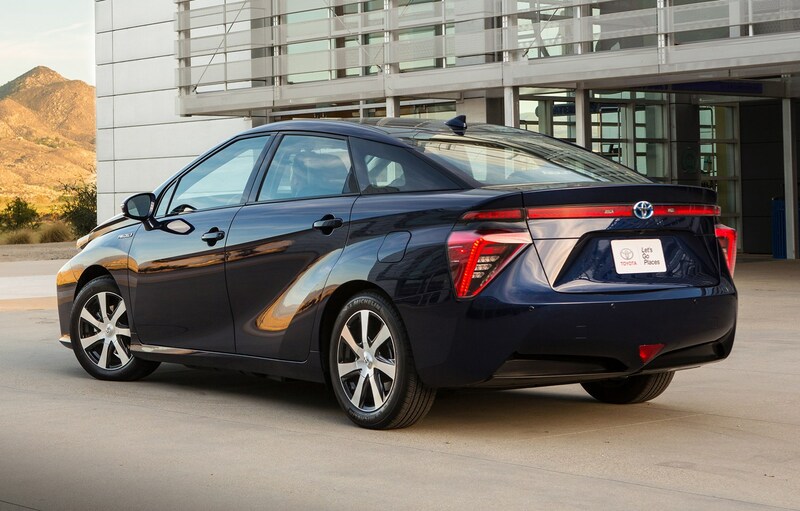 No wonder, then, that Toyota has named it after the Japanese word for future. 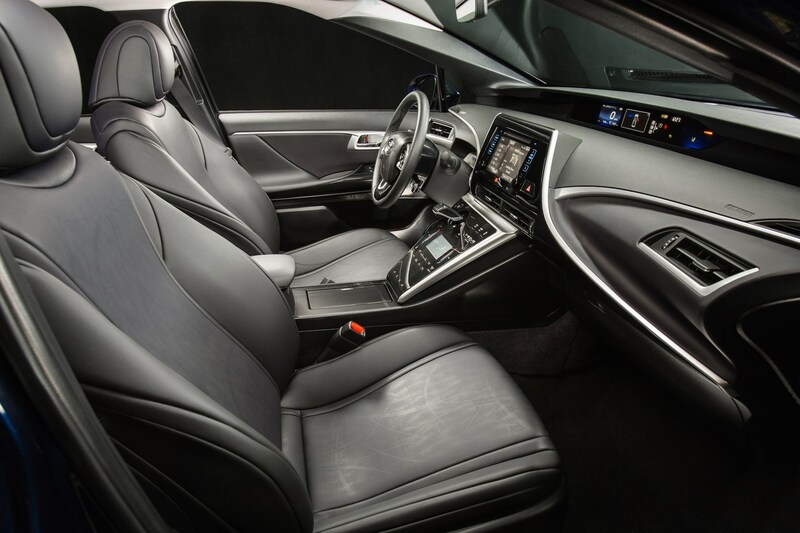 Ordinarily, it's at this point in a review we'd list its rivals, but unless you're patient, and Honda delivers the Clarity here any time soon, you're going to be stuck. 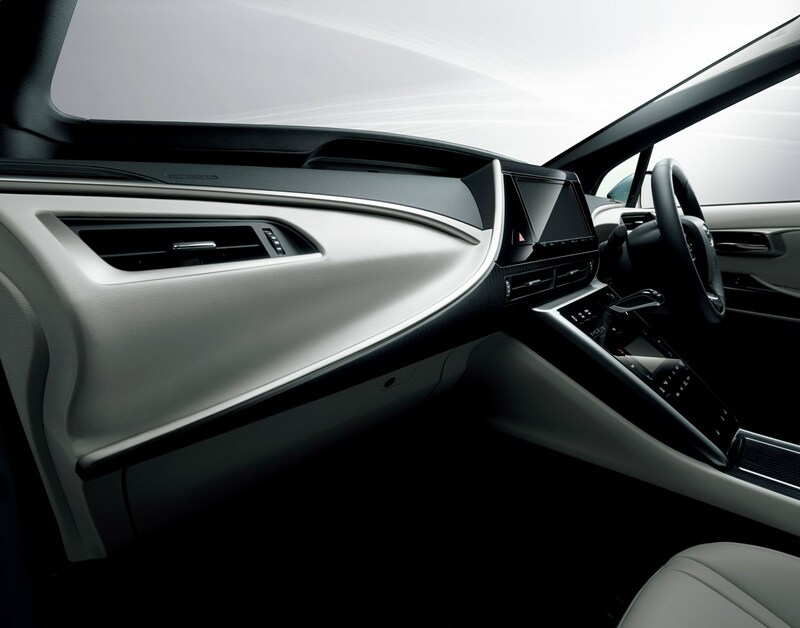 It's a car for early adopters – think of it as a Tesla Model S alternative that you're going to keep until 2025. 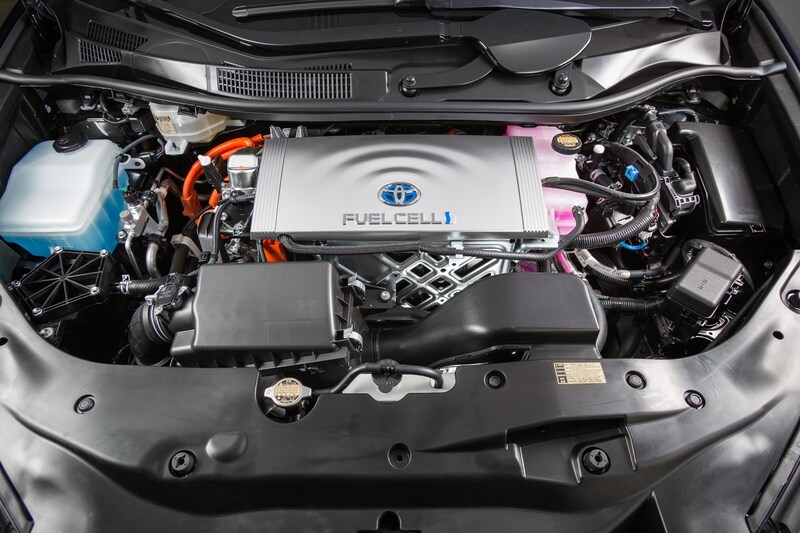 Many manufacturers have worked together to develop and release trial batches of hydrogen fuel cell cars, but Toyota’s the first to deliver its automotive fruits to market for anyone to buy. 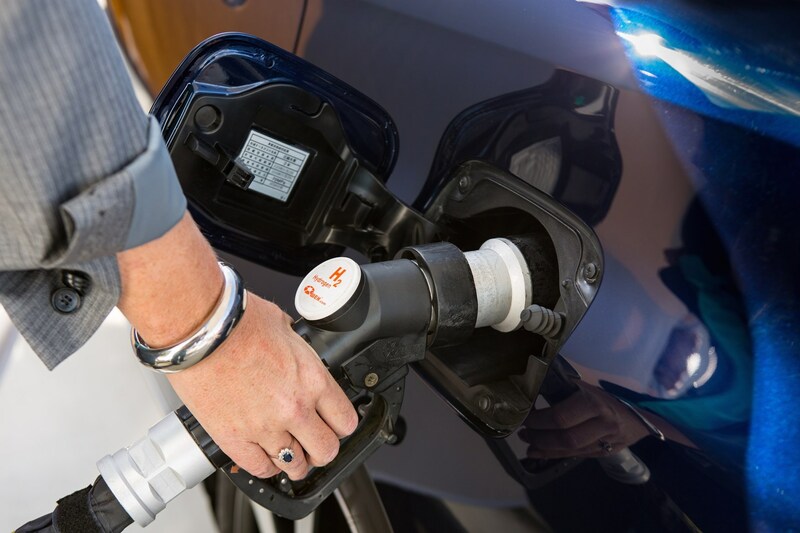 As of 2017, there were 15 filling stations in the UK – with five of them near London, and the others split between Swindon, south Wales, Yorkshire and the west coast of Scotland. 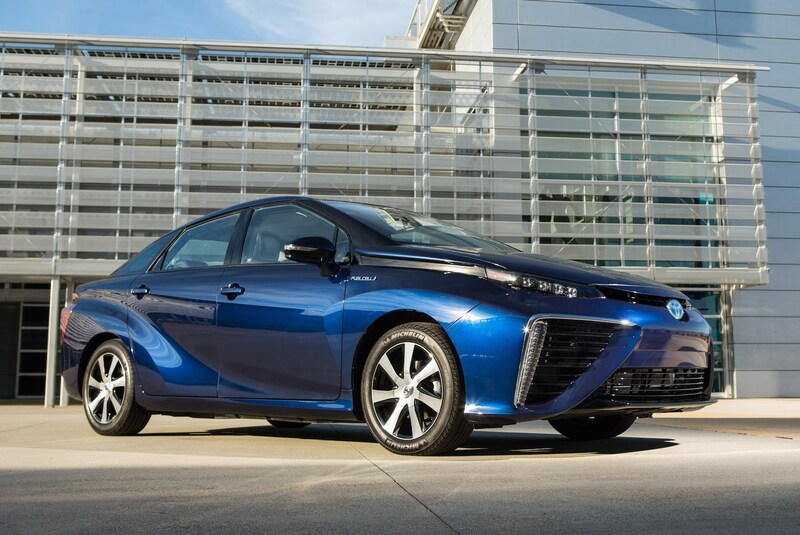 So, your options to own a Mirai are very geographically limited. 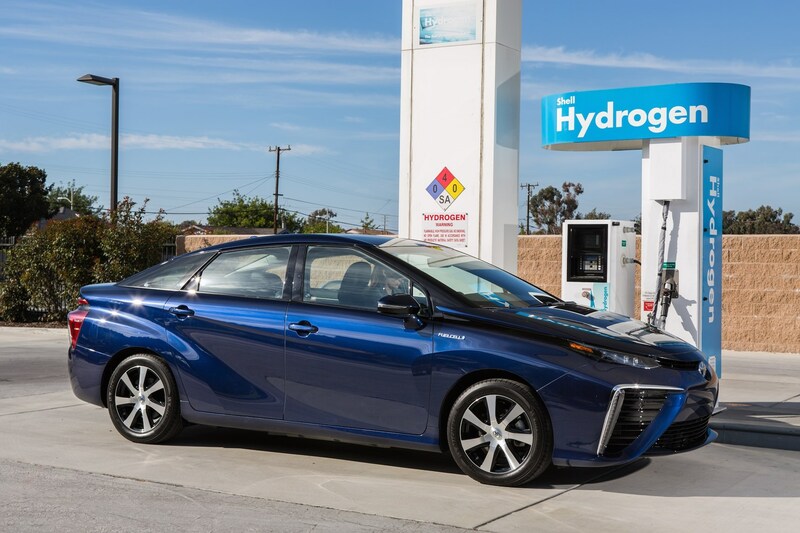 But the plus side is that if you do live near a filling station, and lease the car from Toyota, you'll get your hydrogen refills covered. 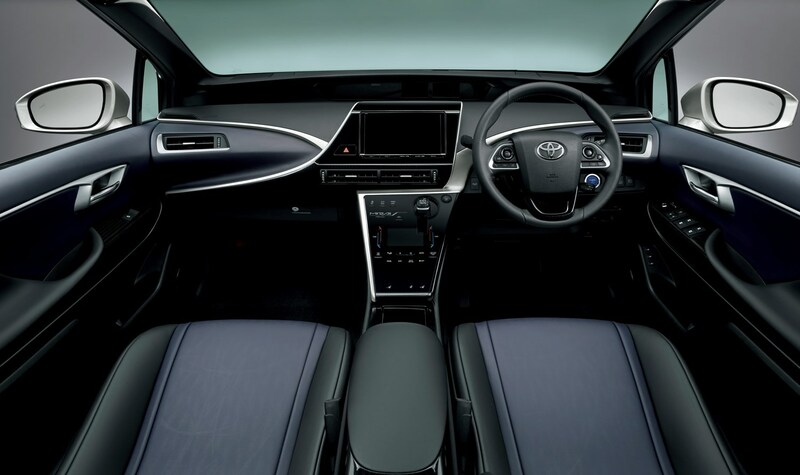 A lease typically costs around £1,000 as advertised on the Parkers website. 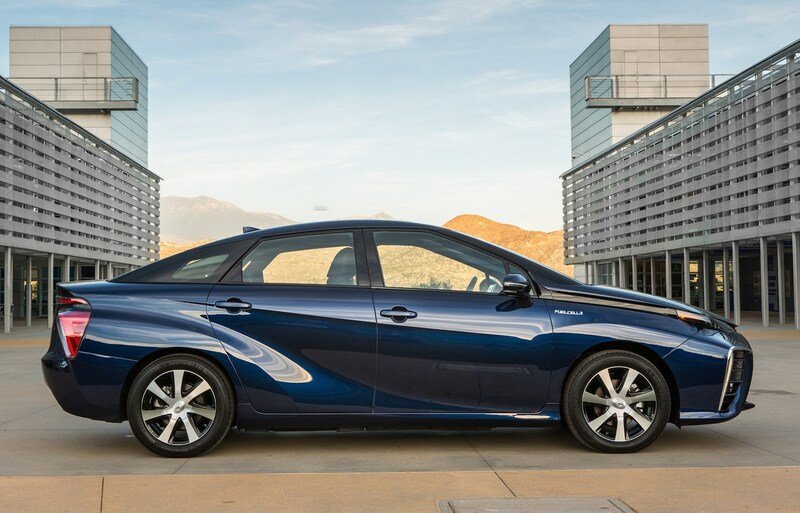 Toyota says there has been no decision made on whether this arrangement will continue on second leases yet – but none are due to return until 2019. 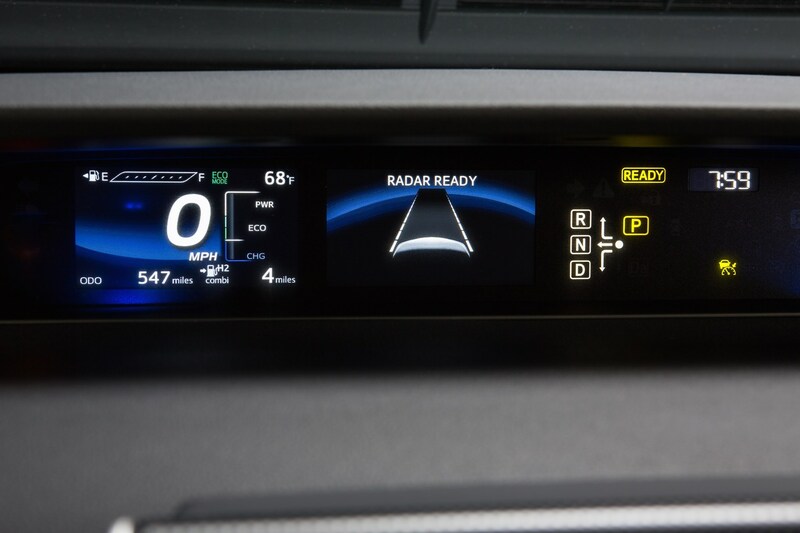 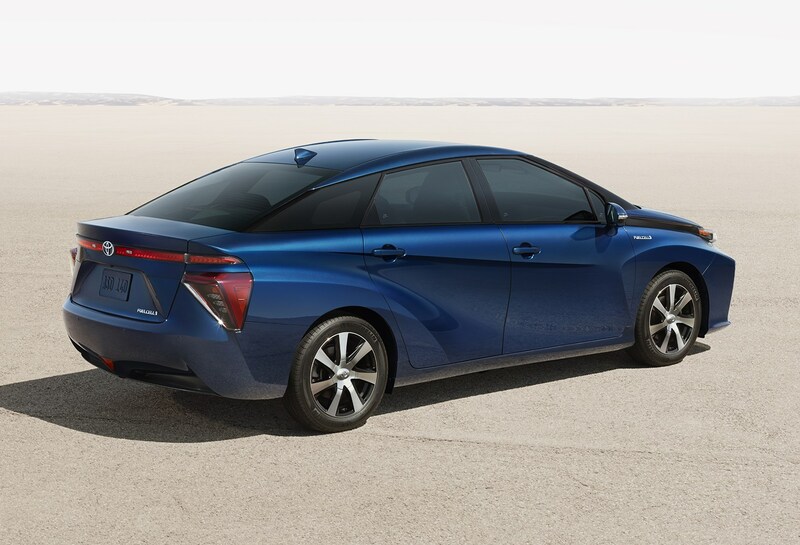 The company doesn't push it as a big seller, there's the Prius that satisfies that need. 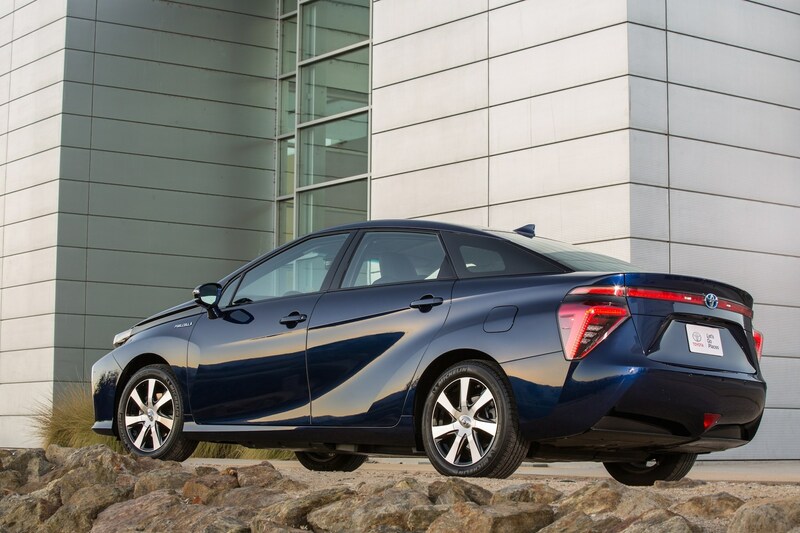 Toyota says that it is likely to cap the number of cars on the road in the UK to 50 – at least until 2020. 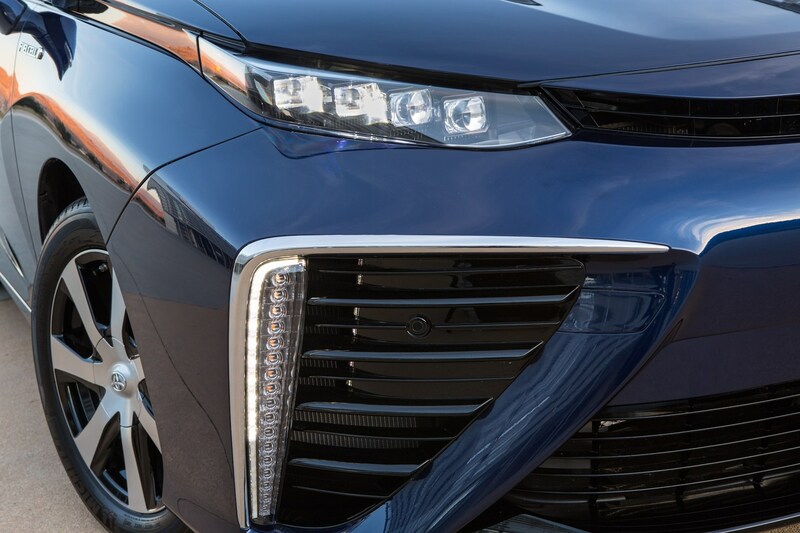 This is in part due to the newness of the technology making some customers wary, but also because it’s likely to carry a significantly higher price than the Prius. 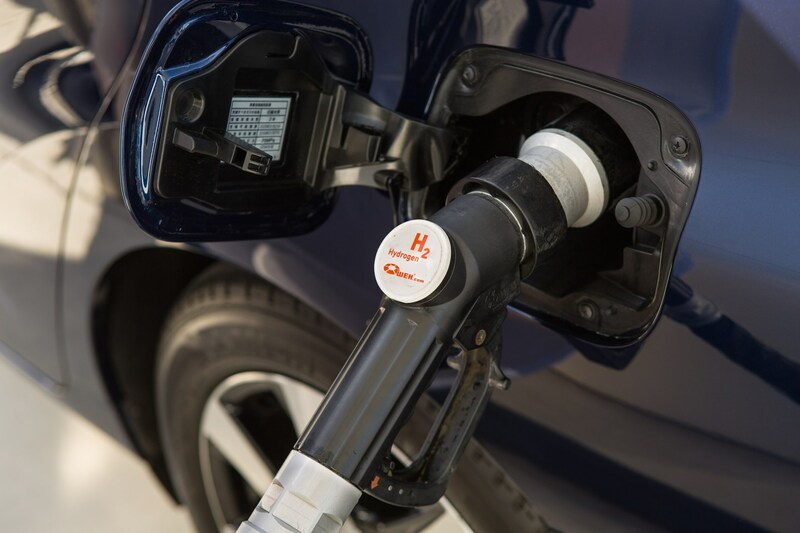 It won’t have escaped your attention that currently there’s a conspicuous lack of hydrogen refuelling pumps at filling stations either. 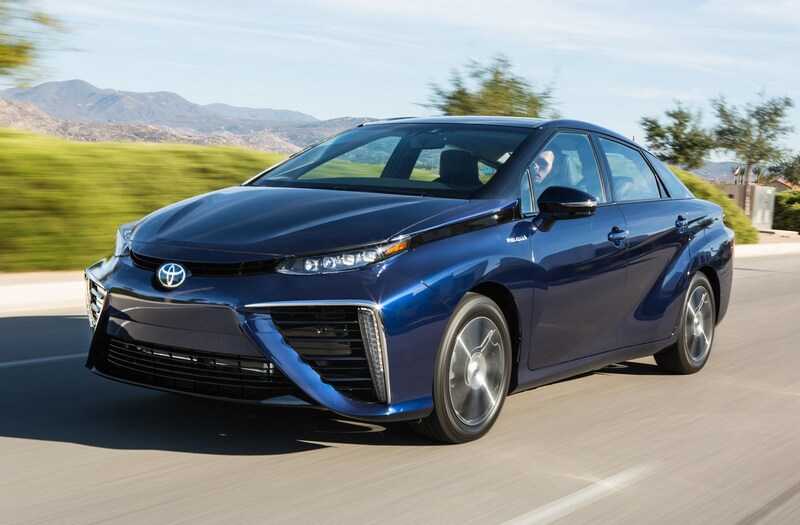 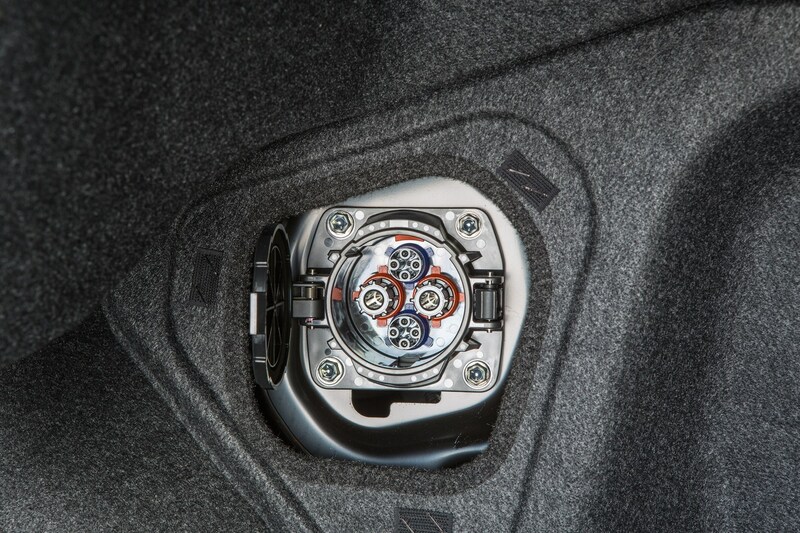 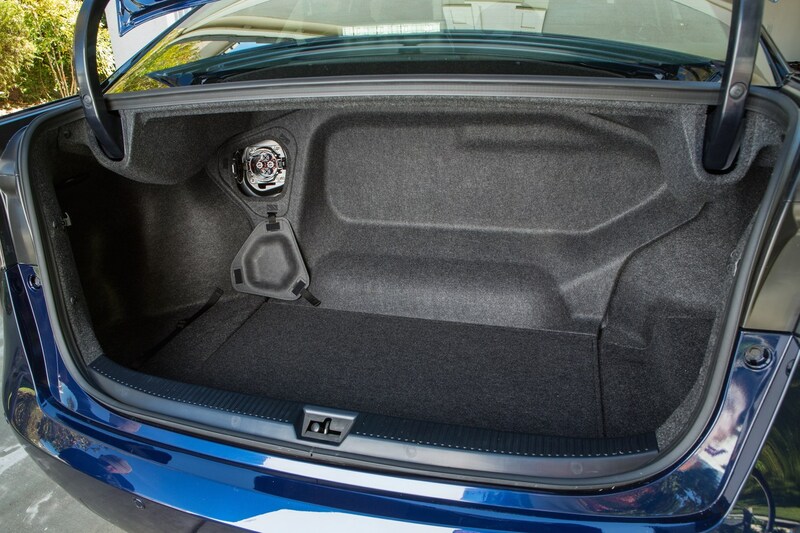 When empty, refilling the Mirai’s trio of high-pressure, well-insulated fuel tanks takes around three minutes, in a process that’s almost as convenient as replenishing a petrol or diesel car’s reserves. 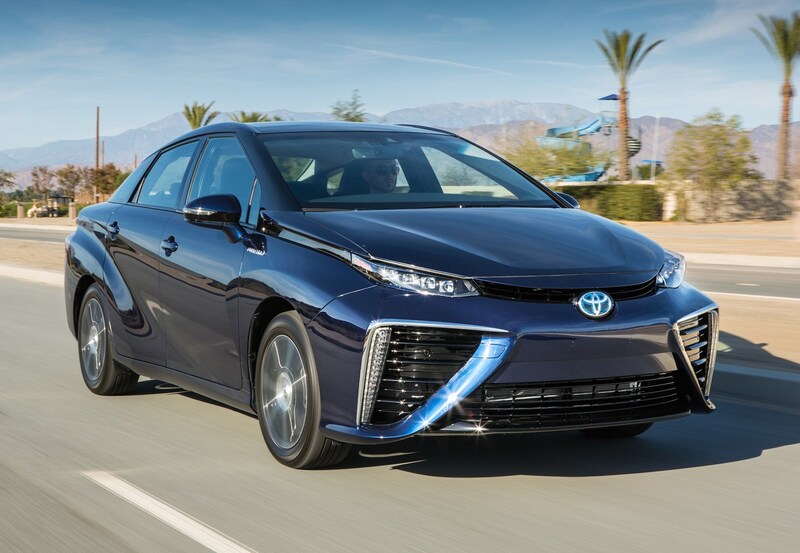 Rather than sending the hydrogen fuel to a conventional engine, it undergoes a chemical reaction in a fuel cell stack, generating electricity to propel the Mirai motor. 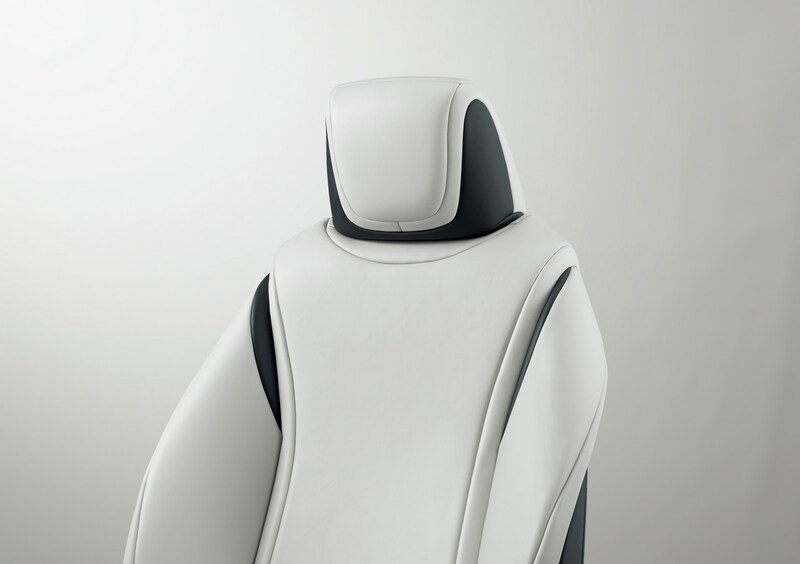 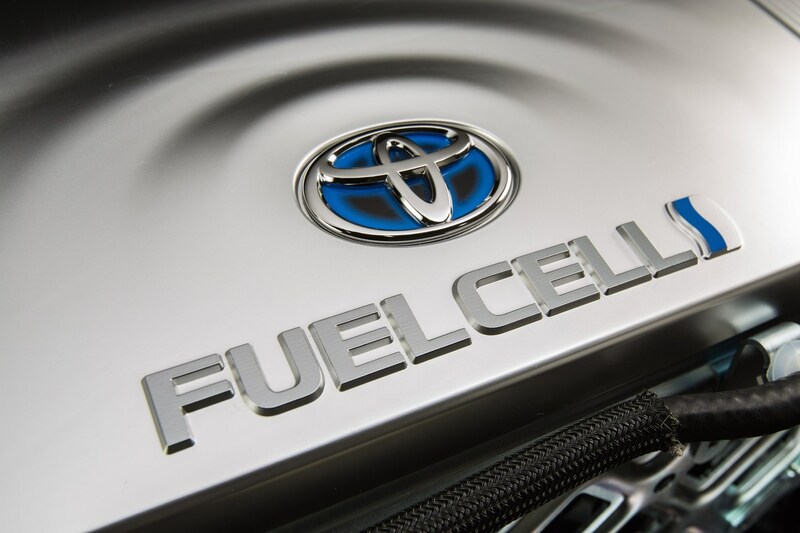 Toyota claims its fuel cell uses industry leading 3D fine mesh flow channels allowing the module itself to be more compact as a result, beneficial when you have to find space in the body for passengers and luggage. 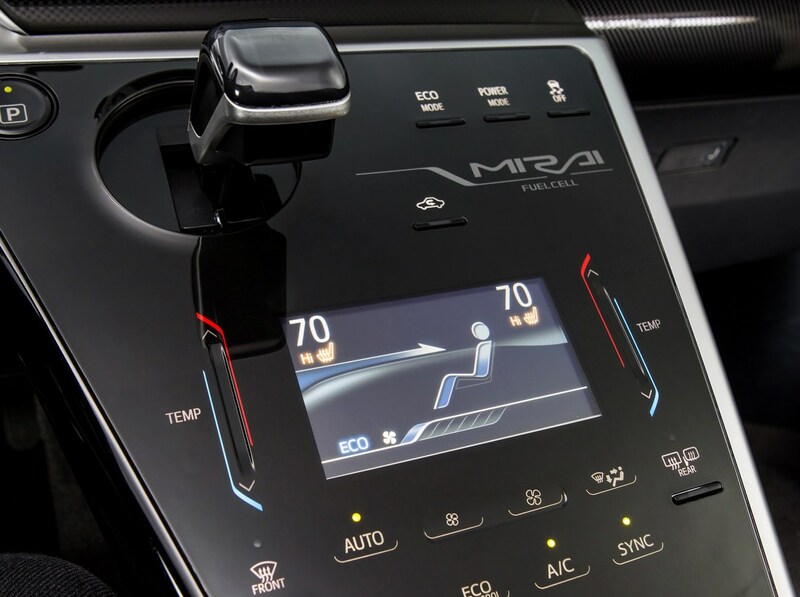 Combined with a fuel cell boost converter, the Mirai produces 151hp (113kW), resulting in a claimed maximum speed of 111mph and a 0-62mph time of 9.6 seconds. 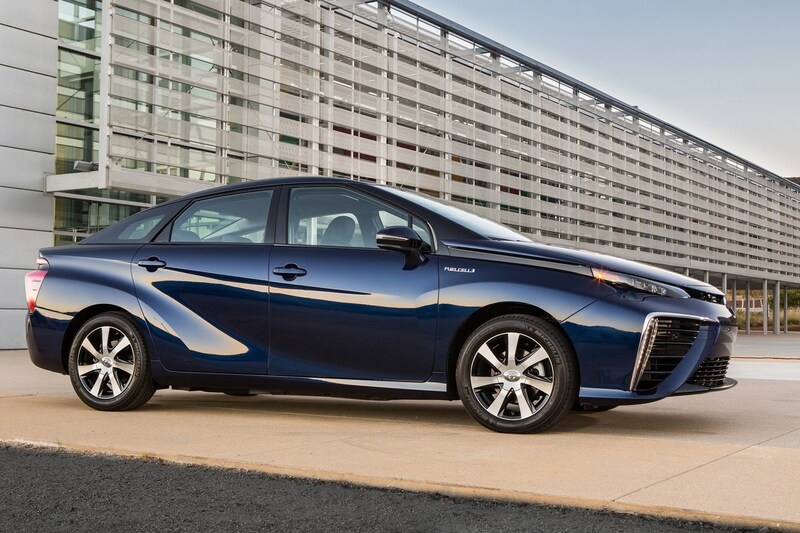 Hydrogen fuel cell technology means that the Mirai produces zero CO2 emissions, the only by-product being water (and in some cases clean air), not harmful gasses. 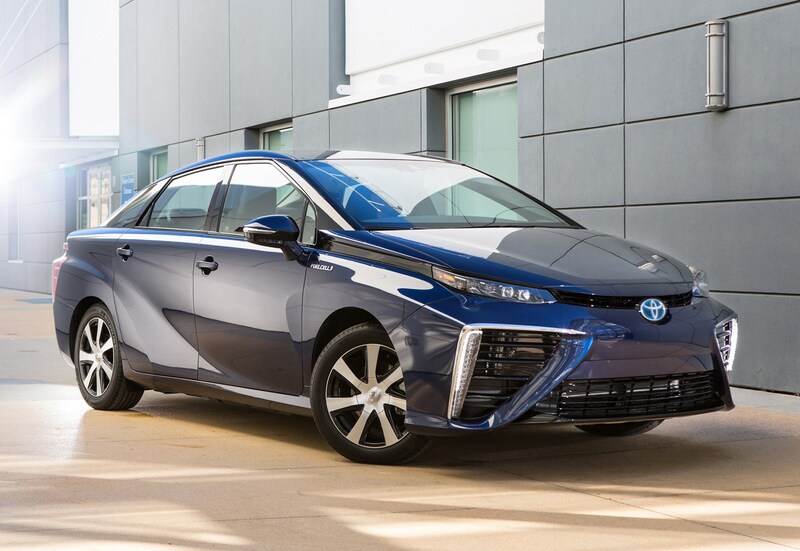 Even before you wow your friends and neighbours with the fuel cell facts, the Mirai’s looks are bound to stimulate endless conversation. 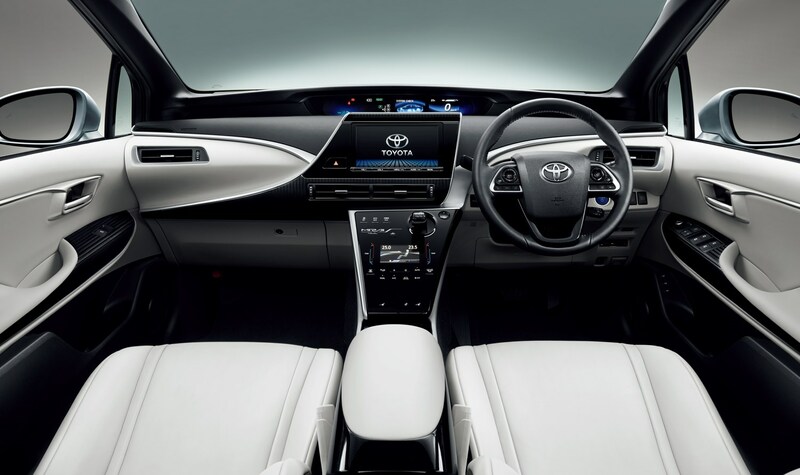 Size-wise it’s similar to the current Avensis saloon, its tapered shape and smoothness promoting aerodynamic efficiency, while those wide grilles at the side of the nose supply copious amounts of air ensuring the fuel cell system is cooled effectively. 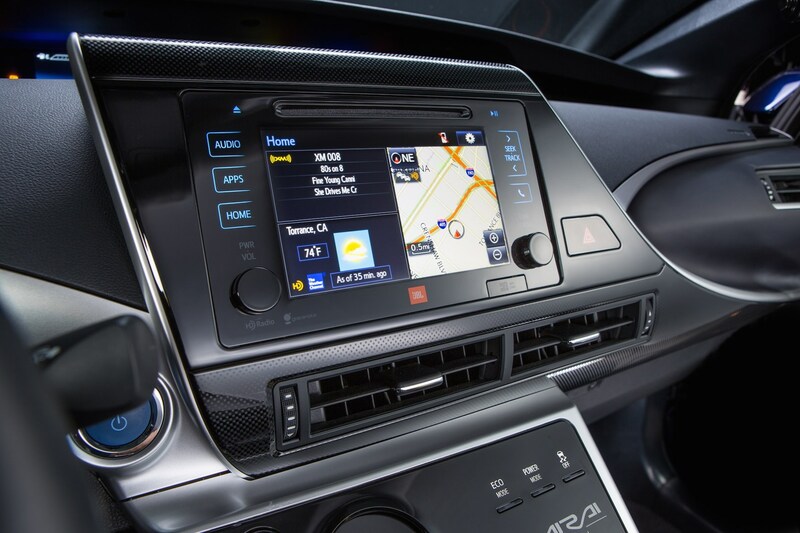 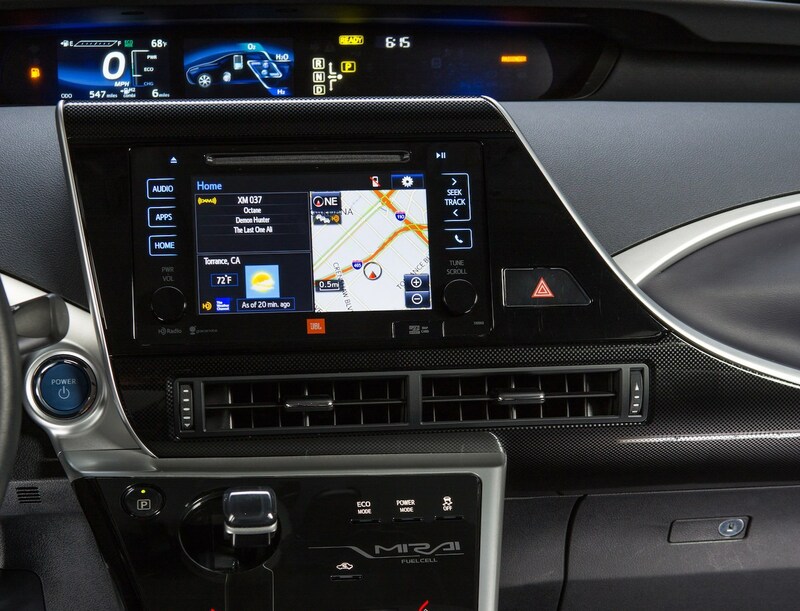 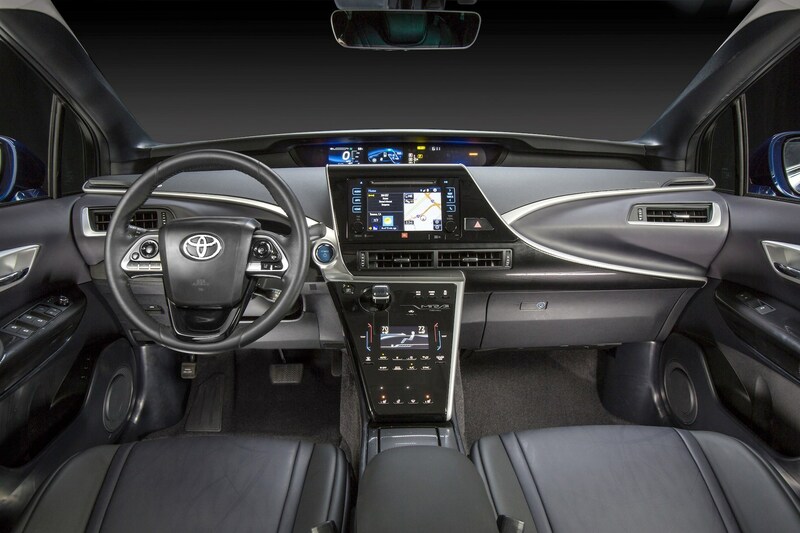 Inside the spacious five-seater cabin, Toyota’s boldness continues, with LCD screens providing information and touch-sensitive switchgear to operate its wealth of controls. 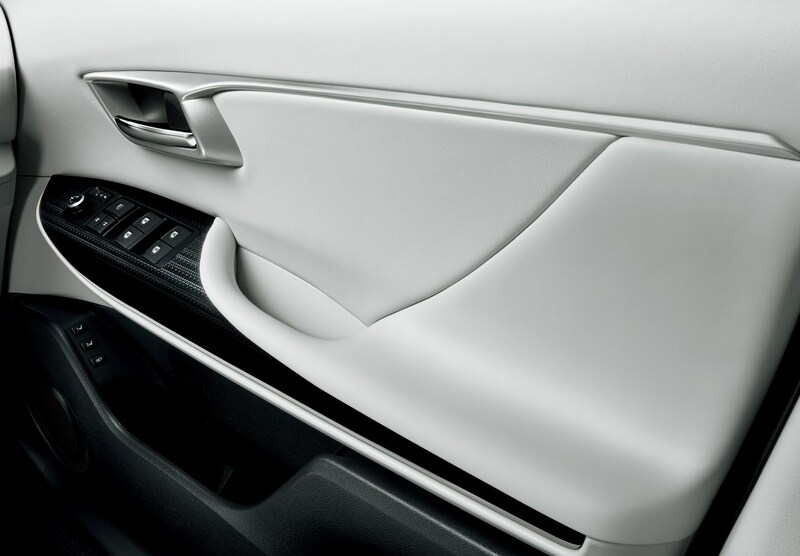 In an about-face compared to many of the brand’s most recent offerings, the interior mouldings are soft-touch, and rewardingly tactile – again reflecting buyer expectations at this higher price point. 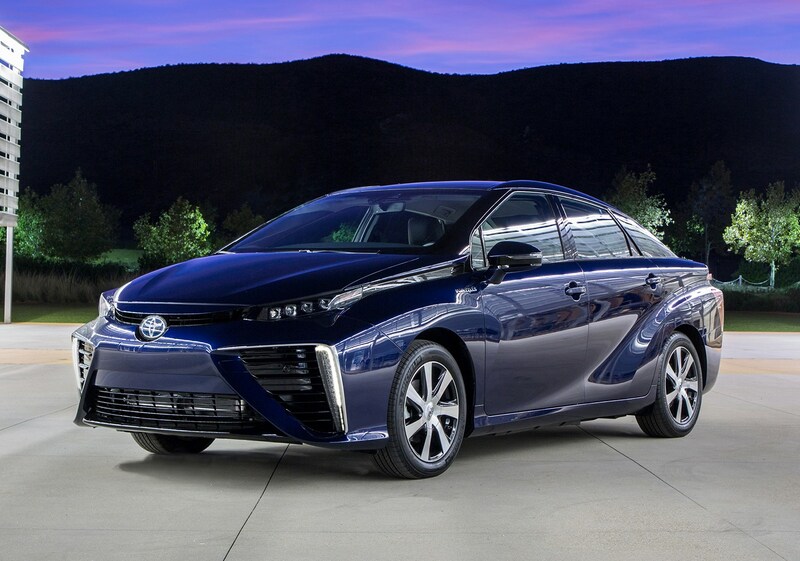 You don't buy a car like the Toyota Mirai for rational reasons. 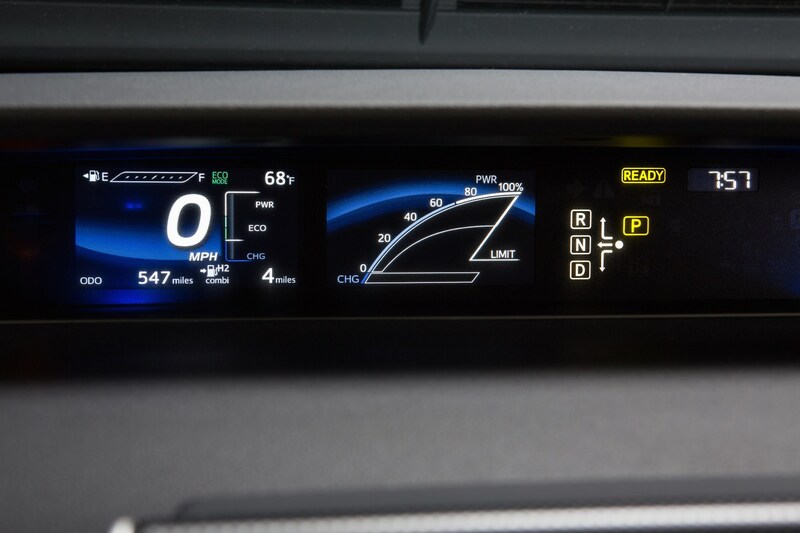 It's not cheap to buy (nominally, it cost £66,000 in 2017, with a discount of £4,500 thanks to the government OLEV grant), and costs a similar amount to lease than a hugely more appealing Tesla Model S.
It's also dynamically so-so, with an unsettled ride, lifeless steering and adequate performance. 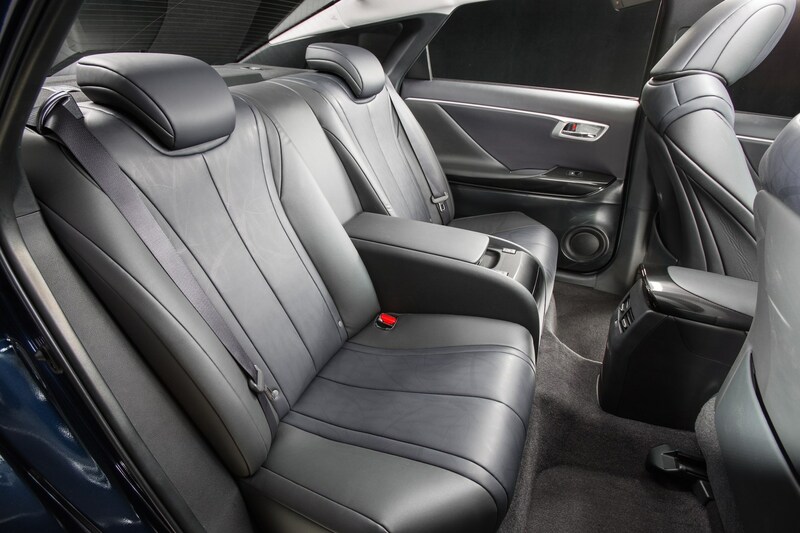 Inside, it's commodious and well equipped, but not especially so. 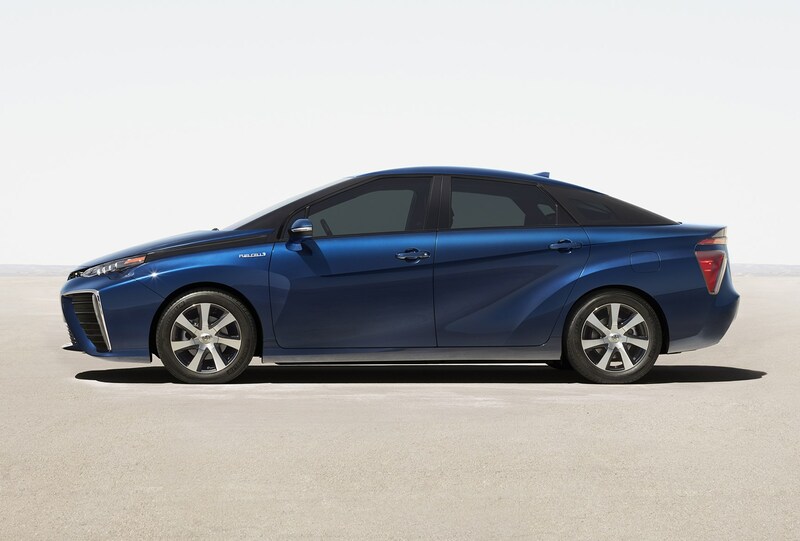 Especially compared with the more conventional alternatives. 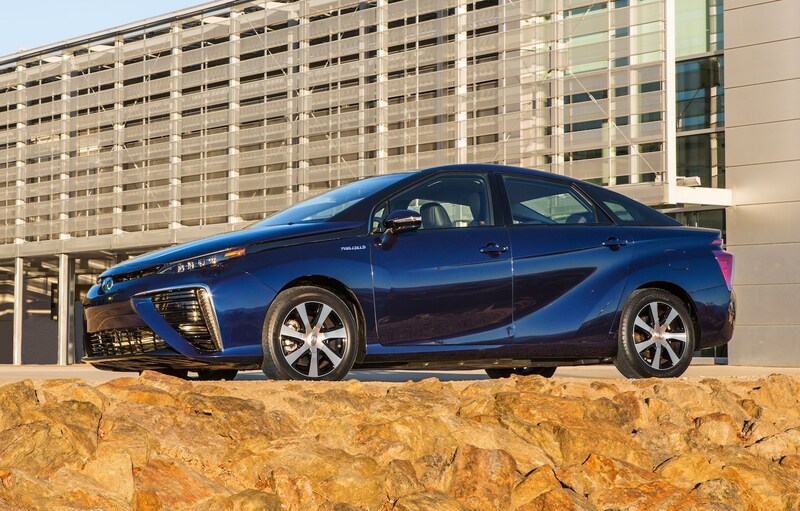 But to measure it in those terms would be to completely miss the point of the Mirai. 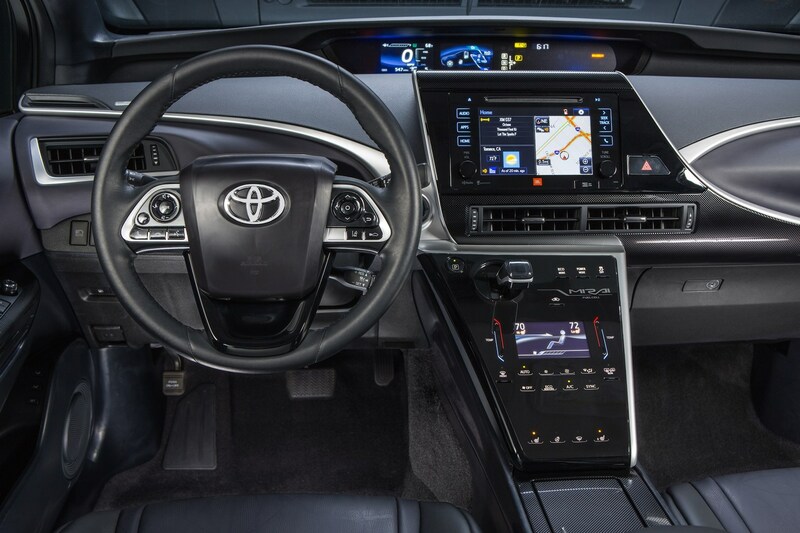 It's a taste of the future that Toyota has brought to us nice and early – and, rather like its electric rivals, if your life situation can make it work for you, then it's an interesting and satisfying car to own. 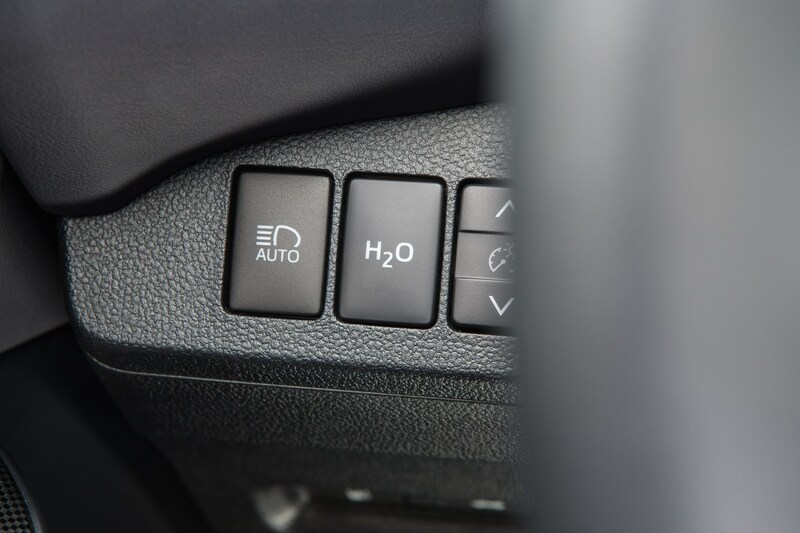 There's nothing quite like having your own access to an empty fuelling station that won't cost you at the pump – and equally, you can't knock the fact that your car emits nothing but pure water. And in these times of increased environmental awareness, there's a great deal to be said for that.